Looking for a job, especially at a job fair, can be a lot like trying to get a date at a crowded bar — there are plenty of potential dates to choose from, but chances are none will want to dance with you or date you for the long-term. If you’ve ever been to one of the many job fairs across the country, you’ve seen the long lines of job applicants with resumes in hand, all pushing for a spot up front to get a recruiter’s ear. It’s a meat market without the drinks. I’ve been to a few since being laid off in June 2008, and have for the most part found them to be a waste of time unless you go in prepared and with a goal of networking rather than getting a job immediately. With hundreds of people to talk to, it’s difficult for recruiters or human resource representatives to give your resume enough attention and to remember who you are, so it’s a good idea to leave the job fair with the understanding that while your work there probably won’t lead to a job now, any contacts you make should help in the future. “Not doing something is definitely not an option. Candidates definitely want to be proactive,” said Edward Ryabovsky, vice president of business development and recruiting for Hold Brothers, a financial services company in New York. As a corporate recruiter who finds venues for career fairs, Ryabovsky told AOL Jobs in a phone interview that the odds of getting a job offer after applying at a job fair are remote. Of 350 resumes he got at a recent a job fair, he phone screened 12 of them, interviewed four in person, and offered a job to one candidate, who ended up taking a job elsewhere. But don\’t take that one-out-of-350 figure to heart for the long haul. “Just because we don’t have a need at that particular time does not mean a need will not show up” later, he said. That’s why going to a job fair just to network and get your name and resume in front of people who you can call later for a follow-up discussion is important, he said. Unless a job fair is aimed at a specific type of worker — such as for engineers — most job fairs will attract the same types of employers. They include government agencies that are always hiring, such as the FBI and fire departments, and industries that rely on sales and have high turnover, such as life insurance, car sales and financial advice. Dress appropriately. The candidate who wears a business suit will get noticed by an employer, while the one in casual clothes will get passed over, Ryabovsky said. Ask smart questions. Just dropping off a resume won’t impress a recruiter. Ask questions about the job you want, offer your business card and ask for theirs. Build your network. Through LinkedIn, an e-mail or phone call, contact everyone you’ve met after a job fair to follow up and see if you can meet in person. Expect low-paying jobs at many job fairs. 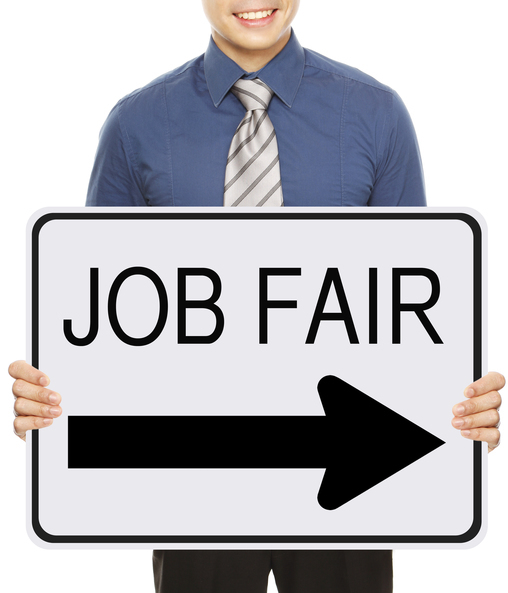 High turnover and low pay is partly why some companies are constantly at job fairs. They need to constantly hire. Once you realize this, either stay away from those employers, or ask how quickly you can move up or if there are other, better-paying positions that you’re qualified for. Even if they don’t have a job for you, they might know another company that does and can pass your name along. Research the companies you want to talk with. Know before you walk in the door what companies you’re interested in, research them and have something intelligent to say or ask about the company when you get to the front of the line, advises Lavie Margolin, a job search adviser in New York. Talk yourself up. Along with networking, getting out and socializing with other unemployed people at a job fair is a way to keep your social skills working and practice interview techniques. The big crowds of a job fair are enough to put off Stanley Lee, an electrical engineer who is looking for work. Instead, Lee recommends approaching start-ups, successful entrepreneurs, or team leads with proposals for short-term free work as a way to get a foot in a door. To really shine as a candidate, recruiter Bruce Hurwitz recommends knowing how to write a proper business e-mail when following up an introduction at a job fair. Of 100 applicants he sees at a job fair, Hurwitz said that 10 to 15 will follow up by e-mailing him their resumes, but only one will do it professionally. That’s the person he wants to see at a job fair. If that’s not you, you can still have a good time at a job fair. After finding job candidates crying in the parking lot outside of job fairs because the whole experience was too depressing, Julie Austin started Fun Job Fairs, where for a fee ($39 for the Nov. 9 bowling job fair in Hollywood, Calif.) job seekers can bowl, play miniature golf, shoot pool, go to a comedy show or other fun activities with an HR representative from one of many companies. If nothing else, you’ll get to work on your bowling game for a few hours — and if you’re lucky, the HR rep will like you enough to want to hire you. For months, all we\’ve heard from endless political ads and sound bites is how \”we need to put the American people back to work.\” But in this 24-hour-news world, that\’s become a song with no end. The jobless are facing an uphill battle and staying jobless for longer periods of time than ever before. On top of that, the organization that goes into these job fairs, the press releases, the photo-ops – all the businesses that tout how many jobs they have to offer … and all the disappointed folks who walk away not getting them. It\’s enough to make you wonder if these job fairs even serve a purpose. Is it about all the companies that are there? The TV cameras? Heading out to a job fair these days, it is obvious, they are about: Desperation. Regret. Failure. Effort. Loss. Grief. All of it reinforced by massive job losses, from financial services to construction. There, in the long line of hundreds, thousands of people waiting to get in are the faces of the jobless, the unemployed. Many – often in the thousands – would not get a job that day. Sometimes the job fairs are so packed that employers have to leave – with no materials left to hand out, overwhelmed by so many inquiries. Fun Job Fairs is a different approach – an opportunity for you to meet prospective employers in a more relaxed environment.